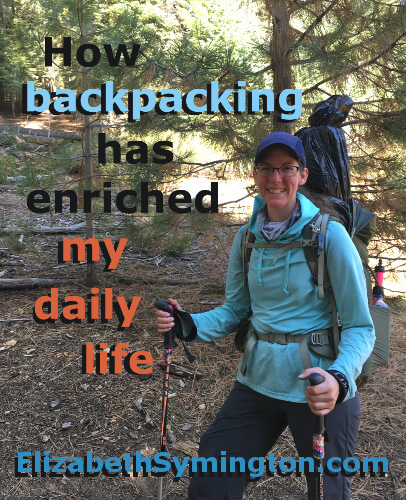 This is Day 20 of the 31 day series on “How backpacking has enriched my daily life.” I expected lightweight backpacking to be a hobby. Instead it has transformed me for the better. When I return from a backpacking trip, the amount of trash that I’ve produced is disheartening. I love the outdoors and yet I throw away lots of single-use plastic items. This bothers me because I want to be environmentally conscious no mater what I’m doing. The convenient thing about backpacking is that I can see exactly how much trash I produce and analyze what am I throwing away to see if I can switch to a less harmful method. Most of my backpacking trash is used toilet paper and vacuum-sealed food wrappers. It’s time to cut back on my trash and recyclable items at home and while I’m backpacking. I already live a conscious lifestyle, but there is so much more that I could do. I don’t like being dependent on things and yet, my life revolves around plastic. What would it be like to live plastic free? Beth Terry, from Oakland, CA, blogs about her journey of going plastic free on her blog, My Plastic Free Life. I’ve known about her site for a while, but I’ve been intimidated and overwhelmed by the politics, science and the shear size of this lifestyle change. My backpacking trash really bothers me. So much so that I’ve decided to greatly downsize my dependence of plastic, one area at a time. I’m starting with my travel and my home toiletries. On Day 10 of this series, I wrote about switching to a bamboo toothbrush and how much I love my tooth powder. Today I’m sharing why I prefer solid shampoo bars to liquid shampoo. 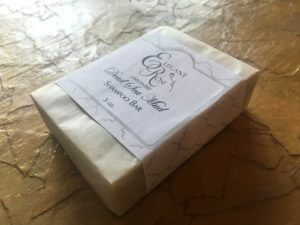 I bought the Dead Sea Mud shampoo and body bar from Elegant Rose Boutique. The bar not only lathers and gets my hair clean, it also adds enough moisturizer to my hair that I don’t need any conditioner! I also use the bar to wash my body. It is a 3 in 1 bar! Talk about simplifying my shower routine and lightening up my travel toiletry kit! I also love that Elegant Rose’s products are 100% natural and they do not use any dyes, synthetics, preservatives or artificial fragrance. As a side note, in my research for a shampoo bar, I learned that gluten can be in toiletries. I’ve been gluten free for 12 years or so and I’m embarrassed to admit that it never occurred to me to read the labels on toiletries. The above shampoo bar has wheat germ oil, which might contain trace amounts of gluten. I haven’t noticed any reactions to wheat germ oil, but that might be because I’m gluten intolerant. I am not as sensitive to gluten as people with Celiac Disease. The bar doesn’t come in a plastic bottle (obviously). Shampoo bars don’t leak, so I don’t have to worry about cleaning up messes due to leaky bottles or altitude changes. I can put shampoo bars in my carry-on! My goal is to figure out a liquid-free toiletry kit. I’ll keep you posted. Right now I’m using up the last of the liquid shampoo and conditioner in the house, then I’m switching over full time to shampoo bars! Thank you backpacking for pushing me to go plastic free.